Disney has been on something of a remake/sequel frenzy as of late. Not only did it just release a live-action remake of Dumbo, but, according to Time Magazine, it has another 11 other sequels or remakes in the works. While this spate of remakes has been met with a mixed reaction, it’s also become the source of something of a conspiracy theory. If you’ve been on Facebook, Twitter or elsewhere on social media, you’ve likely seen memes like this one. This is a similar beat that you can find on Twitter, Facebook and on virtually all social media. The problem is that it’s completely untrue. 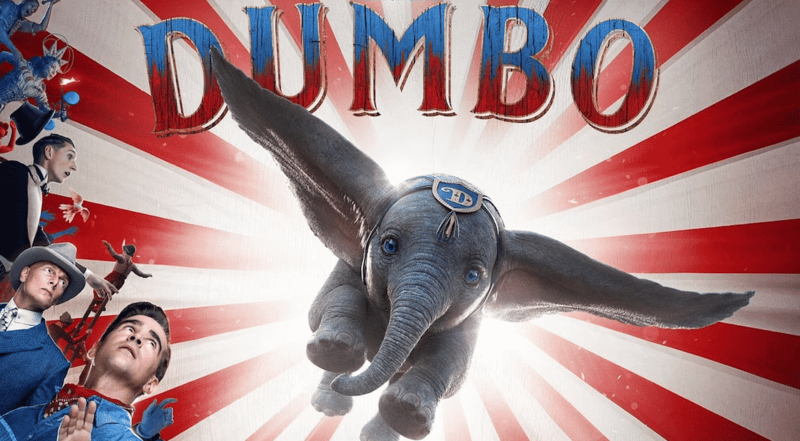 The release of a brand-new Dumbo film does absolutely nothing to impact the copyright term on the original 1941 film. Under the current law, that film is scheduled to enter the public domain on January 1, 2037. That’s on January 1st the year following 95 years after its publication. The remake doesn’t change that nor does it matter if Disney rereleases the film or releases an updated version of the original. That term remains the same. For proof of this, you can look to a wide variety of public domain works and how they’re used in our society. One excellent example of this is Mary Shelly’s Frankenstein. The book itself, first published in 1818, is long in the public domain. 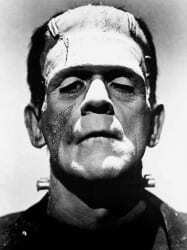 However, in 1931, Universal Pictures released its iconic film starring Boris Karloff and created a new copyright-protected work that itself will lapse into the public domain on January 1, 2027. When Universal released its movie, the original book didn’t simply drop out of the public domain. Others were allowed and continued to sell copies of the book and make their own adaptations. However, Universal did make things difficult in one way. As the most famous film adaptation, its version of Frankenstein’s monster became so iconic that it was virtually equated to the book. Since the book didn’t include a detailed description of the monster, Universal owned that version of the monster. Others, including Hammer Films, did their own versions but they had to make sure that their version of the monster was stylistically different from Universal’s. A similar situation is currently ongoing with Sherlock Holmes. Most of the original stories by Sir Arthur Conan Doyle are in the public domain. However, the ones published after 1923 are still protected by copyright. This resulted in a very specific verdict where the character of Sherlock Holmes was largely placed in the public domain save some of his characteristics that were introduced in later stories. Once again, the later works did not extend the copyright on the older ones nor did they protect Sherlock Holmes as a character, despite protests from the Doyle estate. In short, new works, whether authorized or unauthorized, do not extend the copyright on the original. As a result, the Dumbo remake doesn’t change anything with the original movie. However, that’s not to say that copyright didn’t play some role in the decision to create the remake. Just maybe not the role many think it does. The reason for this is that copyright affixes to a “original works of authorship fixed in any tangible medium of expression.” In short, it applies to works and specifically precludes ideas, procedures, concepts, etc. A new work can’t extend the copyright on an old work. 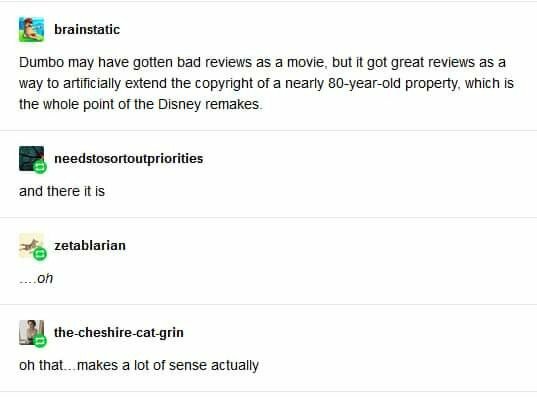 If it did, Disney and other rightsholders would be constantly modifying and re-releasing new works based upon old ones to extend the clock. While it might seem like we’re in remake/remix/sequel hell, there would be much, much more of it if that were true. 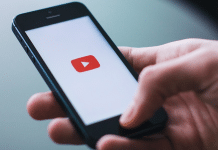 While there have been some releases motivated by extending copyright, they’ve been about the individual works themselves. For example, in 2013 Bob Dylan’s label released a limited 50th Anniversary Collection so that the unreleased tracks would be counted as published, meaning they would be granted a longer copyright term in the European Union. There’s simply no case where a new work extends the copyright on an old one. However, this doesn’t mean that copyright didn’t motivate the decision to do a remake in 2019. First, with the work expiring in less than 20 years, Disney is running out of opportunities to use their exclusivity on the property. Especially if they want to do sequels or incorporate it in some kind of larger universe. Second, there’s little doubt that Disney hoped that this version of the film would become the definitive version and that people who see it as the real one, a replacement for the 1941 film. That clearly hasn’t happened, but if it had, Disney might have been able to do something similar to Universal and find a new way to control the future of Dumbo the character even after the source material lapses. However, that’s not the same as renewing or extending the copyright on the original work. That’s creating a new work with a new copyright term that is so popular it makes people forget about the original. Judging from the reviews, that didn’t happen in this case. However, it doesn’t mean Disney, and other rightsholders, won’t try the same approach. Most likely, as more and more works march closer to the public domain, this is something we’ll be seeing a lot more of. Copyright and its term are affixed to a work, not an idea, a property or a series. You can’t extend the copyright of a previous work by publishing a new one, you just create a new work with a new term. Obviously, there are other issues that do need to be considered including trademarkybtfrvqdbbvvrwrvyw, which can be perpetual. According to a 2003 Supreme Court decision, trademark can’t be used to extend copyright but that only applies to the work itself. This can set up some interesting future battles of Mickey Mouse, Dumbo and other characters that are both copyright and trademark protected. Still, when it comes down to it, Disney is not trying to extend or renew the copyright on the 1941 Dumbo. There’s simply no way for it to do that barring a change in the law. Since such a change seems impossible, expect Dumbo to fly into the public domain on January 1, 2037, exactly on schedule.